"I started writing for younger readers by chance. After years of writing for an adult audience a friend persuaded me to aim for a different age group -- I had a go and found that I loved it! It took me right back to the thrills of reading as a kid: the sense of discovery, the sheer wonder of stepping into another world through the pages of a book. I've never had so much fun writing. 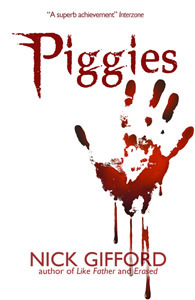 Piggies probably shows what a dark sense of fun I have..."